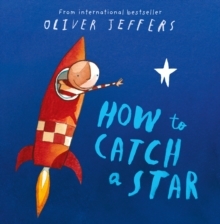 The beautifully illustrated, original debut picture book from shining talent, Oliver Jeffers. There once was a boy who loved stars so much that he wished he had one of his very own. Every night he watched the stars in the sky from his bedroom window and dreamed of how he could be their friend and how they could play hide-and-go-seek together. So, one day, he decided to set about catching a star of his very own!